DC’s Legends of Tomorrow finally returns next week for the back half of its third season and The CW has unleashed an extended “A War Is Coming” trailer featuring not only scenes for next week’s episode, but also some exciting footage from the rest of the season. Taking Supergirl’s spot on Monday, the time-travel comic book series returns with a new episode titled “Daddy Darhkest” where John Constantine (Matt Ryan) enlists the Legends’ help in the case of a demonic possession. Taking them to a present-day asylum, the crew of the Waverider is surprised to find out that the possessed girl the exorcist, demonologist and occult detective is trying to help is none other than a young Nora Darhk (Madeleine Arthur). 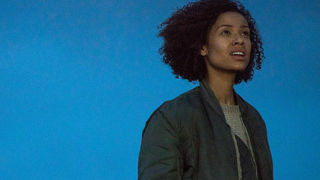 According to the official synopsis, “during the exorcism, Sara (Caity Lotz), Leo (guest star Wentworth Miller) and Constantine go missing, leaving Ray (Brandon Routh) and Zari (Tala Ashe) to try to take care of Constantine's client.” The episode will also see Nate (Nick Zano) and Amaya (Maisie Richardson-Sellers) come face-to-face with Kuasa (Tracy Ifeachor). Some of the footage featured in the extended trailer comes from another future episode which will involve pirates: and where there's pirates, there's bound to be some swashbuckling adventure. But the one thing fans have been waiting for but we still don’t get to see is Wally West (Keiynan Lonsdale), aka Kid Flash, in action as he is set to join the team in Episode 11.